One of the quarterly tasks that every Exchange administrator should do is to install new Cumulative Update for their Exchange 2013 server. While most of the time such upgrades are painless sometimes you reach a problem. In our case Microsoft.Exchange.Configuration.Tasks.ServiceDidNotReachStatusException: Service ‚WMSVC’ failed to reach status ‚Running’ on this server. was enough to stop us for even trying an upgrade. 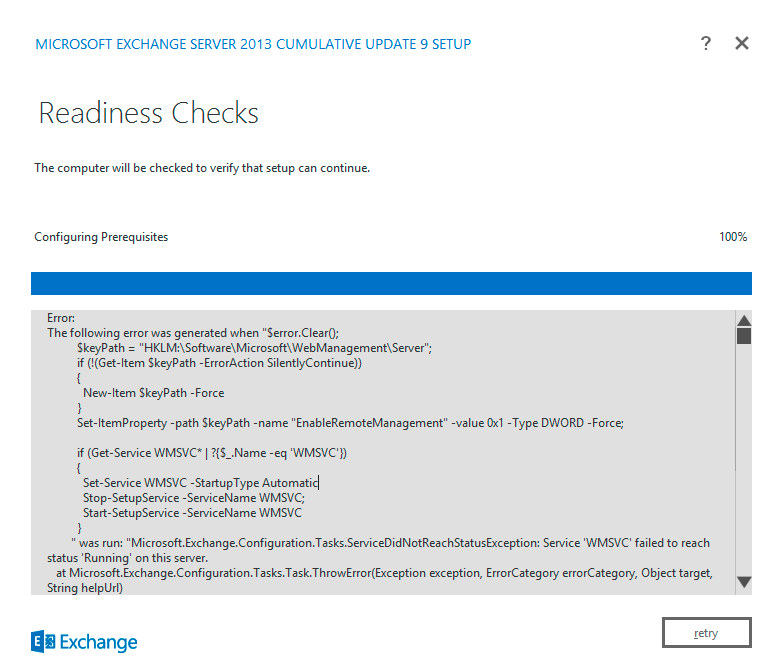 During Readiness Checks for Microsoft Exchange Server 2013 Cumulative Update 9 (CU9) installator decided that it cannot start a service. ” was run: „Microsoft.Exchange.Configuration.Tasks.ServiceDidNotReachStatusException: Service ‚WMSVC’ failed to reach status ‚Running’ on this server. After a quick look at services console (services.msc) Web Management Service was indeed down. So how to fix this error? 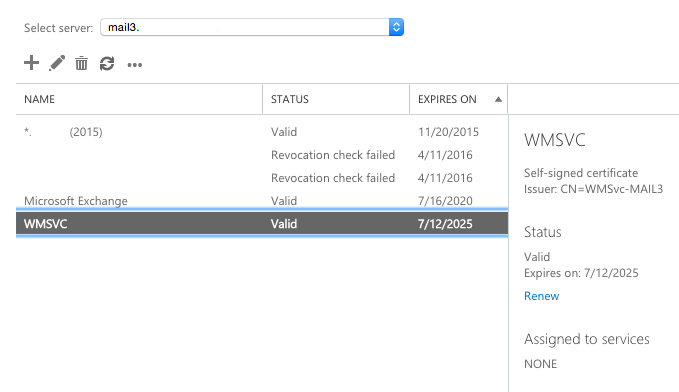 It turns out the service requires an SSL Certificate to be available in IIS. Unfortunately one of the administrators setting up certificates wanted to have „clean” certificates Window, and since certificate in Exchange ECP looks unused there's nothing stopping you to delete it. 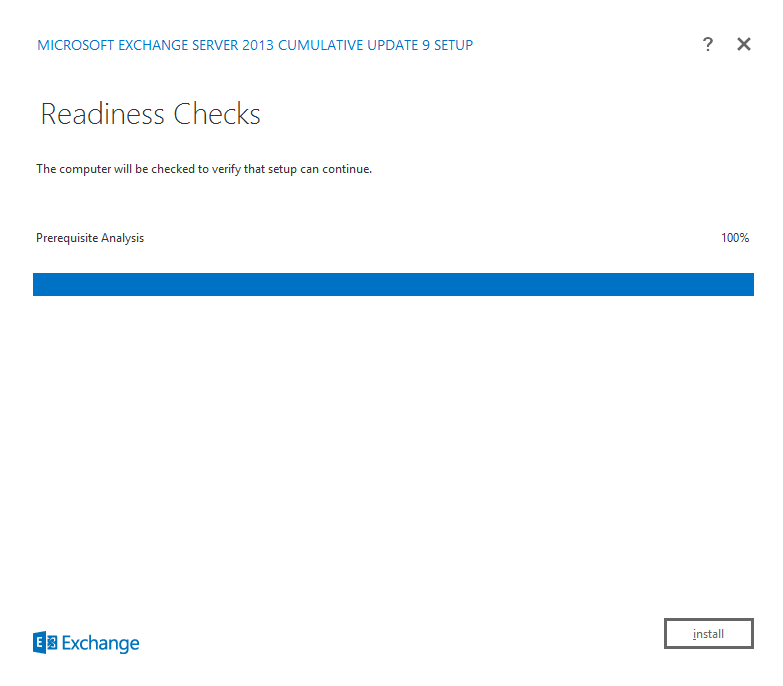 Quick look at new installation of Exchange 2013 at certificates window shows WMSVC certificate. And in comparison the supposedly cleaner version without the WMSVC certificate. Even though the Assigned Services for this certificate are NONE Exchange Administrators should left this certificate as is. Fortunately if you've already deleted the certificate you can quickly fix it. 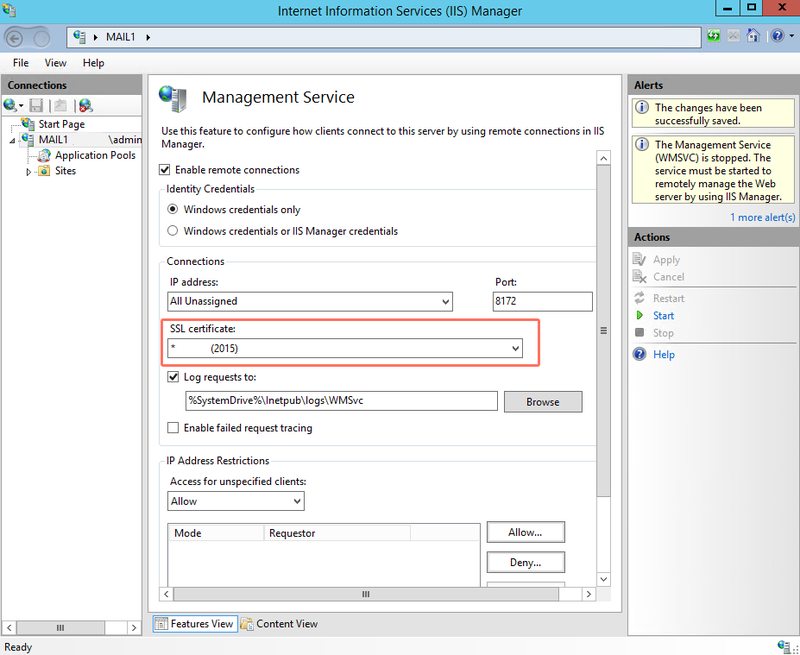 To resolve the problem, you must assign a new SSL certificate to the IIS Web Management Service. Under SSL Certificate, select the new one. 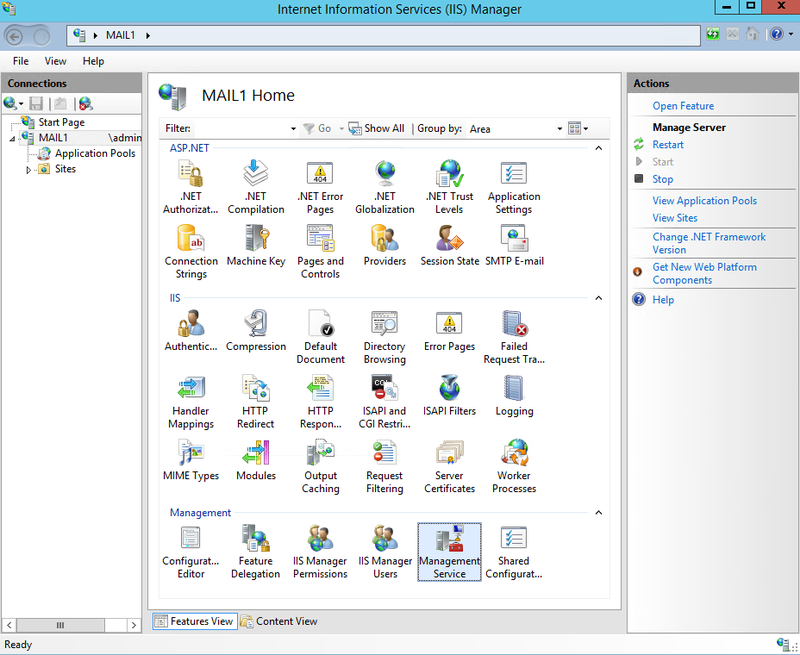 (You can use a existing certificate or recreate a new self-sign with IIS). As you can see on below screenshot it clearly states there's an error with the service. If things didn't went as smoothly you may want to go the long road, but it's a bit untested and risky territory so do it on your own risk. 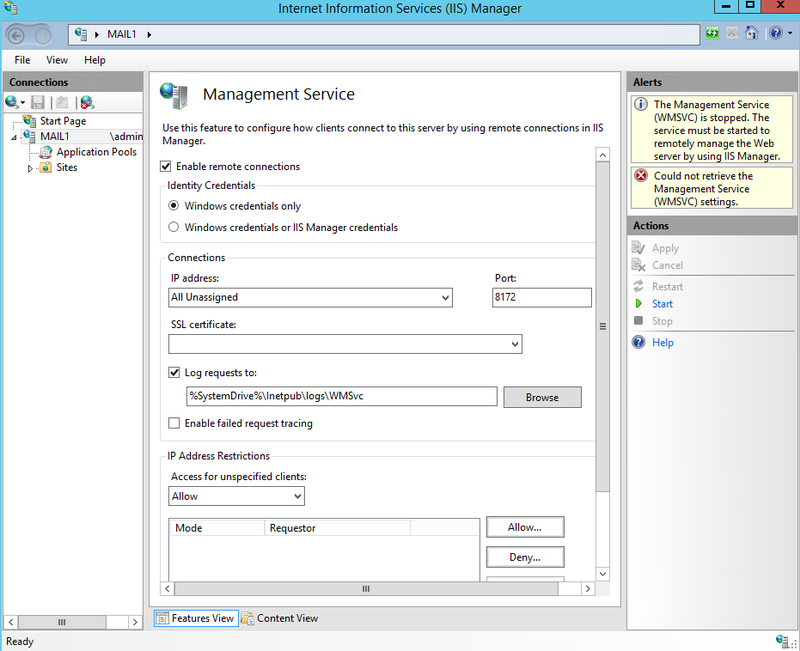 Then open IIS Manager and do the steps from above again.